Walking on the bottom of the sea – me??? If you’ve read my previous post you will know that I have a rather big fear of water. So walking on the bottom of the sea – me??? Hardly likely! I’ve been going through all my old photographs recently, (there are 1000’s) trying to make some space on our bookshelves for Monkey’s expanding library. Whenever I went on holiday, one of my biggest expenses was on getting all my photo’s developed (yes, the pre-digital age – I am THAT old!). Anyway, in 1994 I got married to my first husband in Mauritius. Then, it was a relatively new idea to get married on a beach somewhere exotic, now it’s just the norm. 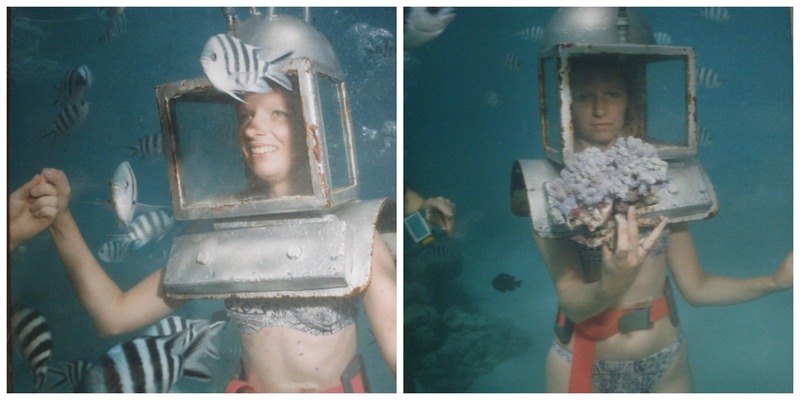 A few days after our wedding, I did, probably the scariest thing in my entire life – I walked on the bottom of the sea. I’ve just googled it and you can still do it, all these years later! I was terrified, I hated water, at that point I could NOT swim at all. My ex was a very good swimmer and always very patient with me on our many ‘water trauma’ excursions. To this day I do not know how I got talked into walking underwater, we went with another couple we’d met at our hotel. We explained my fears to the guide and he briefed the divers who went down with us. We had weighted belts around our waists and wore real old-fashioned diver’s helmets with oxygen lines. We climbed down a ladder at the back of the launch boat and were guided down 3-4 metres to the sea floor. To me, the currents seemed really, really strong – who knows if they were, but I was shaking continuously and held onto my ex for dear life. The divers were absolutely excellent – they checked on me repeatedly. I have no idea how long we were down there, it seemed like hours at the time. But I DID IT. No matter what happens I can always say that I walked on the bottom of the sea as a non-swimmer!!! Here is the evidence …..
My goodness I would have taken one look at that helmet and run for my life!! lol – I wish that those photo’s showed just how terrified I was. Those helmets were blooming heavy too! Thank you – hard to believe it was nearly 20 years ago now! Wow, so brave. I can swim, and I love being in a pool – but I don’t like deep water and I’m not sure I would have managed this… Good for you! Well done for doing it. I’m pretty confident in the water and scuba diving but I must admit that helmet looks pretty scary to me! I’ll never get to the diving stage, tried to snorkle when I did learn to swim but it was a it like learning to drive – too much to think of at once!